This 4-20mA transmitter data-logging kit can be connected to any 4-20mA output sensor and generate a record of measurements collected at set time intervals. 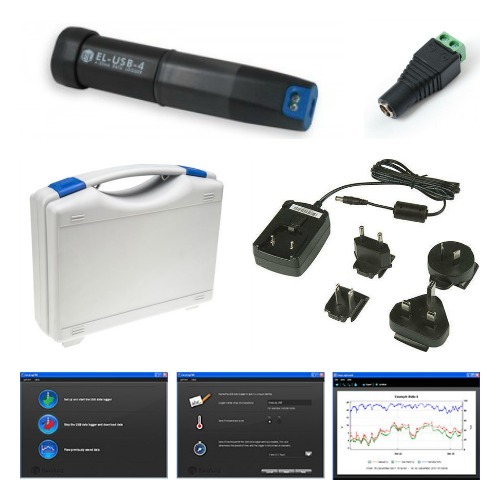 The kit includes a battery powered data-logger, PC software, 24 dc volt power supply, terminal block connections, 5m length of connection cable and a plastic transit storage case. Logger Memory: 32,510 readings max. Logging Interval: 1 second min., 12 hours max. This standalone data logger measures and stores up to 32,000 current loop readings over a 4-20mA measurement range. The user can easily set up the logging rate and start time, and download the stored data by plugging the data logger into a PC’s USB port and running the purpose designed software under Windows 2000,XP, Vista & 7. The data can then be graphed, printed and exported to other applications. The data logger is supplied complete with a long-life lithium battery. Correct functioning of the unit is indicated by a flashing red and green LED. The data logger features a pair of screw terminals and is supplied complete with a set of measurement leads terminating in crocodile clips. The software is included with each data logger. Easy to install and use, the control software runs under Windows 2000, XP, Vista & 7. The software is used to set-up the data logger as well as download, graph and export data to Excel. The 24Vdc power supply is used to provide power to a 4-20mA transmitter if it is not already part of a powered current loop circuit. The power supply comes with a assortment of AC input clips and will accept a voltage range of 100-240 VAC and frequencies from 47-63Hz for compatibility with the mains supply in different countries. If I use the 4-20mA logger with a pressure transmitter, can I set and change the pressure range on the graph? The EasyLog software will allow you to set up any measurement unit and range associated with the 4-20mA input, and you can also enter your own custom unit. Can I save the record in Excel or as .csv file? The EasyLog software that comes with the logger includes an automatic export button for Microsoft Excel. The data is stored as a .txt file which you can also import into other spreadsheet programs and convert to .csv file format. Please enter info about your required product specification and type of application, plus any other requirements. Send us your enquiry for 4-20mA Transmitter Data Logging Kit to get assistance with this product type.